University of North Texas Press, 9781574416121, 240pp. Winner of the Katherine Anne Porter Prize in Short Fiction, 2015. Funny, heartbreaking, and real—these twelve stories showcase a dynamic range of voices belonging to characters who can’t stop confessing. They are obsessive storytellers, disturbed professors, depressed auctioneers, gambling clergy. 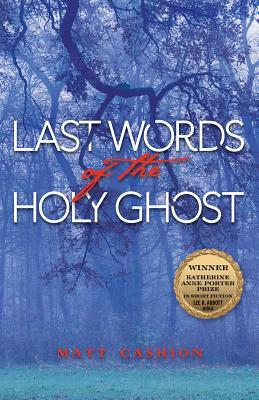 A fourteen-year-old boy gets baptized and speaks in tongues to win the love of a girl who ushers him into adulthood; a troubled insomniac searches the woods behind his mother’s house for the “awful pretty” singing that begins each midnight; a school-system employee plans a year-end party at the site of a child’s drowning; a burned-out health-care administrator retires from New England to coastal Georgia and stumbles upon a life-changing moment inside Walmart. These big-hearted people—tethered to the places that shape them—survive their daily sorrows and absurdities with well-timed laughter; they slouch toward forgiveness, and they point their ears toward the Holy Ghost’s last words. MATT CASHION was born in North Wilkesboro, North Carolina, and grew up in Brunswick and St. Simons Island, Georgia. He earned an MFA at the University of Oregon and now teaches at the University of Wisconsin-LaCrosse. He is the author of two novels, How the Sun Shines on Noise and Our 13th Divorce. He lives in La Crosse, Wisconsin.